St. Mary’s Home, located at 2325 N. Lakewood Avenue, is in the heart of the vibrant Lincoln Park neighborhood of Chicago and stands on the property of the former Alexian Brothers Hospital. It is one of two homes the Little Sisters of the Poor currently operate in the greater Chicagoland area, along with St. Joseph’s Home in Palatine, IL. On July 15th, 2017, the Little Sisters of the Poor celebrated 141 years of service to Chicago’s aged. Abraham Lincoln is said to have invited the Little Sisters to the United States for fear that the Civil War would leave many elderly people without family, and indeed, several homes were founded on the East Coast in the 1860s. In 1872, Holy Name and six other Catholic churches were destroyed by the Great Chicago Fire. Bishop Foley, the administrator of the Chicago diocese, dedicated himself to rebuilding these churches as well as the hospitals and orphanages that the fire had taken from the city. In 1874 he sent a written invitation to the Mother General of the Little Sisters of the Poor in France. 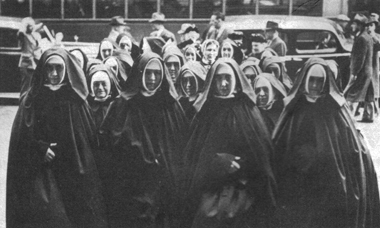 Following his outreach work, the first Little Sisters home was established in Chicago. Two years later, six Little Sisters set up the Sacred Heart Home at 335 North Halsted Street. That home moved to 1255 Harrison Street in 1880. A second home, St. Augustine, opened at 414 W. Chicago Avenue in 1882 and was moved to Sheffield and Fullerton Avenues in 1886. In 1891 the St. Joseph’s Home at 5148 S. Prairie Avenue became the third Little Sisters home in Chicago. By the 1960’s, reform of national health-care standards paved the way for these three homes to close and two new facilities to open. 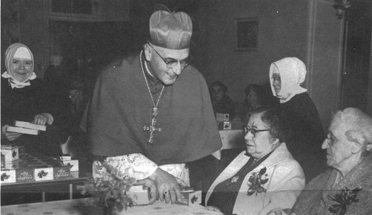 The original Sacred Heart Home was closed in 1959 and many of the Residents were moved to St. Augustine. The original St. Joseph’s Home on Prairie Avenue closed in May of 1966 when the new home in Palatine was completed. St. Augustine Home at Sheffield and Fullerton remained a steadfast haven for the elderly poor for nearly 94 years. In 1980, following an extensive fundraising campaign to build a new home, the Sisters and Residents moved down the street a few blocks to St. Mary’s Home at 2325 N. Lakewood. Whatever our address has been, the mission of the Little Sisters of the Poor remains the same. We will continue to provide a loving home for the elderly poor of Chicago. The Little Sisters’ habits may have changed since this photo, but their dedication remains the same. The Little Sisters’ former home for the elderly on Sheffield Avenue.